AKA John Leonard Swigert, Jr.
Command Module Pilot, Apollo 13, April 11 to 17, 1970. Flew to the moon, but did not land because of an equipment failure en route. He won election to Colorado's 6th Congressional District in 1982, though died from the effects of bone cancer prior to taking office. 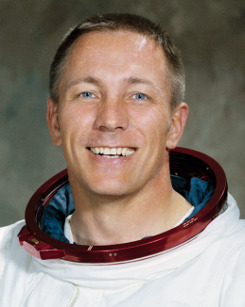 Swigert never married and has no children.